I have known Craig Culver for many years. He has always been a well known swim coach in the area. Yes, I grew up swimming as an age grouper, but I have to be honest, I really wasn’t an enthusiast at a young age. I was a gymnast and a dancer. After 20 years of dancing with a local studio and as a member of the local semi pro basketball team dancers, I was used to being physical on most days of the week, with performances on the weekend. I had torn my meniscus in my knee 2 years before and my labrum in my shoulder in April 2015. With never having experienced a real injury from dance, I knew it was time to retire and pursue other safer areas of activity. After attending a positive women’s seminar, I heard a lady speak about her journey to the Chicago marathon. Shortly after, I too, started to try my hand at running. I started running competitively in January 2015. Also, at this time, I heard from my sister that Craig Culver was starting a masters swim team. Instantly I knew I had to check this out. I loved the coaching, the set up, the workouts and being back in the pool. My brother, and father are avid cyclists, so I also started cycling. 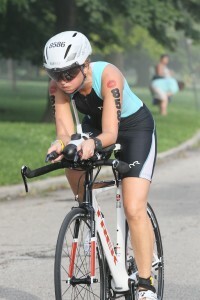 I signed up for a sprint triathlon at my first alma mater Purdue in April 2015. I told Craig about this, and asked his thoughts. He was more than encouraging and supportive. 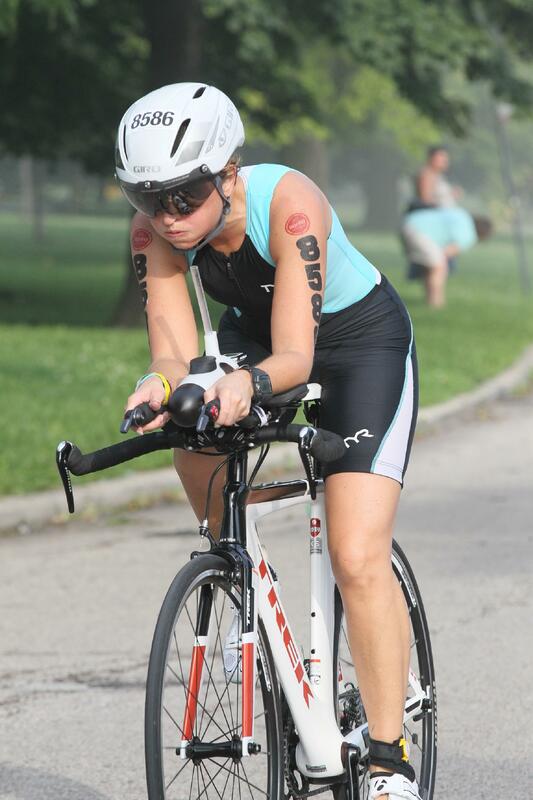 So I completed my first “trained for” triathlon and won my age group, which also qualified me for USAT nationals. I texted Craig right away, as he congratulated me, he also stated that I can do better in the bike area. Of course, I thought, that hilly, windy bike was brutal! On my way home from that race, I signed up for three more races that year. Long story short, I ended up doing 32 races altogether, 9 triathlons, 2 were Olympic distance, one was a 70.3 and one was USAT National Championships! In the meantime, our little swim team of about 6 regulars had grown to over 30 members and 20 regulars. Five of the regular swimmers attended meets at least once a month through the winter season. The same 5 also competed at state and we all placed tope 10 in many of our events. Two of us went to USMS national championships in San Antonio, TX. Before each event, I would text coach Craig and he would give tidbits of advice. As I am often a nervous wreck at races, he would give only what I really needed to remember prior to getting on the blocks. After each event I would text him as to how everyone was doing and how are races were going. He responded right away as if he was just sitting there waiting to hear how we are doing. As a swim coach, Craig will create workouts through out the week and email them out so we can have structured workouts when we were not in an organized practice time. This is very helpful, as he creates workouts for distance swimmers, like triathletes, or sprint intervals for us competitive swimmers, or taper workouts as to what we needed just before state. Craig is the first person I will contact in all my training needs. He is there to tell me when to rest, which I don’t do well. He is there to tell me when I need to swim, like the day before state, just a small 8 minute workout. He is there to tell me when to go hard. Even though it has only been a year, I look forward to the years to come in triathlon and swimming with Craig Culver. I am truly grateful to have him as my coach, supporter, and friend in this crazy world of athletics.